Positively Transparent, the mini version, was selected for the Modern Quilt Guild's new museum exhibit. 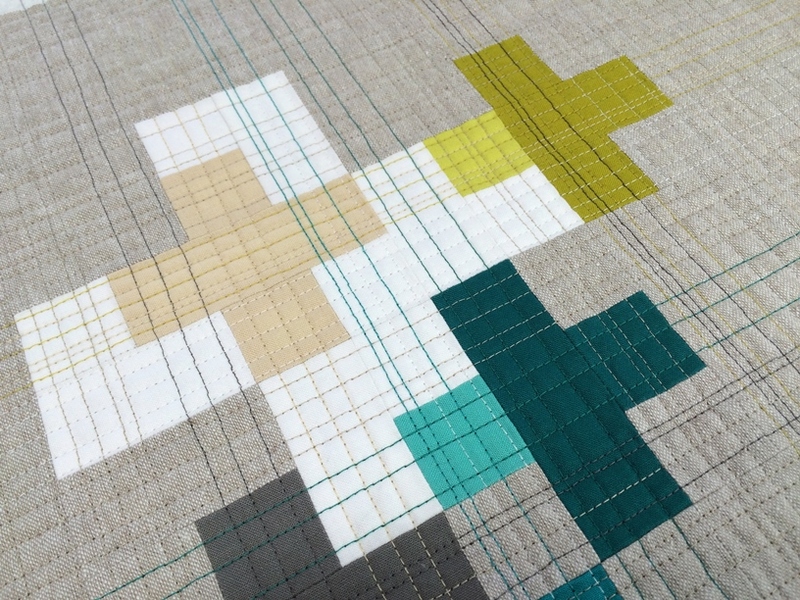 The first stop is The Dairy Barn Arts Center in Athens, Ohio where it, along with many other modern quilts, will be on display until will June 17th. From there, it will go on to the Schweinfurth Art Center in Auburn, NY. The exhibit dates are June 30 - August 19, 2018. Exhibit details here. 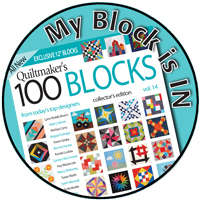 The MQG has a dedicated webpage, ModernQuilts.com, with more information on the book and exhibit schedule. The calendar is here. 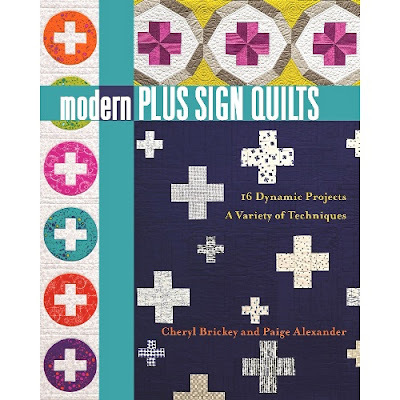 The book I am referring to is Modern Quilts: Designs of the New Century compiled by Riane Menardi, Alissa Haight Carlton, and Heather Grant of the MQG and published by Stash Books. Positively Transparent and Cursive were selected to be included. 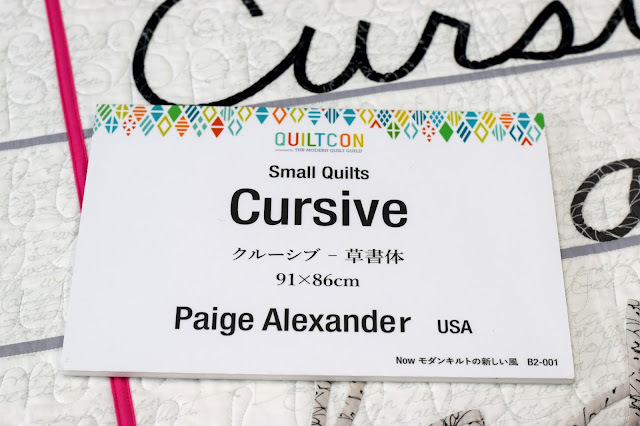 Cursive has just returned home from traveling with the Best of QuiltCon 2017 exhibit. 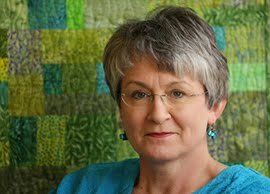 I haven't seen the the quilt since QuiltCon 2017 when it took place in Savannah, GA.
Cursive is a world traveler and has been to the The Sisters Outdoor Quilt Show in Sisters, Oregon (I want to go one day); Festival of Quilts in Birmingham, England; the Australasian Quilt Convention 2017 in Melbourne, Australia; and then on to stops in Japan. When it returned home the MQG was kind enough to send the placard along with it. With all the traveling, Cursive was returned in perfect condition and so I'm glad to have it home again. 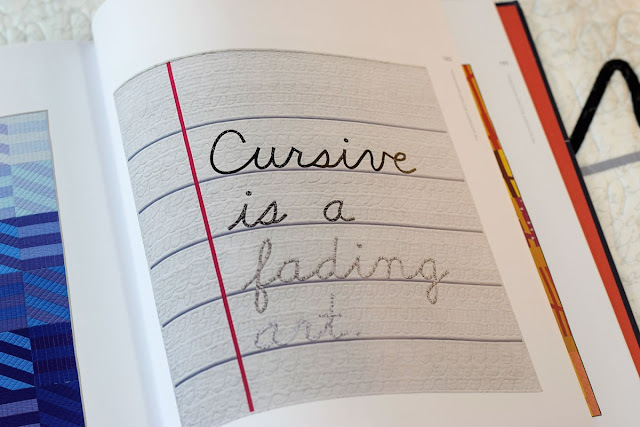 How wonderful to have Cursive home again and in such great condition. 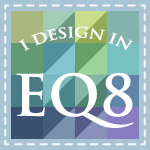 It's fun to think of what traveling for the quilts must be like. 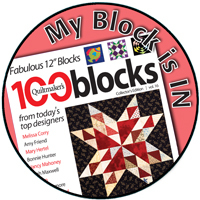 How fun to have your quilts travel the world! I've always loved Cursive. The quilt comes home, and the placard, that is so thoughtful.Love the plus ones, and this will have a tale to tell too. Paige, it must feel really amazing to know your work has been all over the world and enjoyed by so many people. Now you can hang your Cursive quilt and enjoy it yourself! How neat that your plus quilt is going on an adventure, and in turn, that Cursive has come back home. 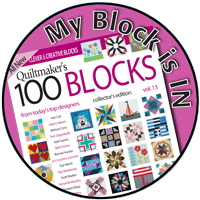 What a fun addition to the story of each quilt too. This just makes me smile. Cursive has had quite an adventure! I was one of the volunteers who helped at Sisters, and I had the privilege of taking it down at the show. Congratulations on having your world traveller home again. You must be thrilled. And congratulations on another quilt beginning the journey. It is exciting to see such success for you. I really enjoyed seeing your work in person Paige ! I'm happy Cursive is safe home now and that another one will be traveling. Congratulations; I so glad to see my favorite Cursive quilt is back home with you. 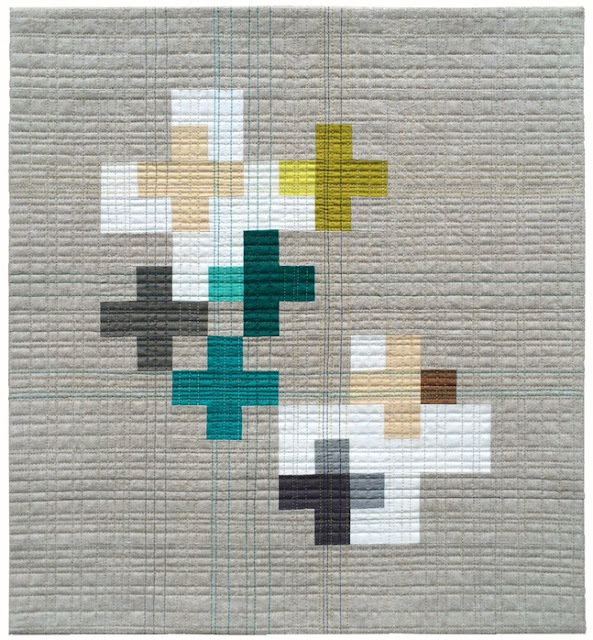 I'll be sure to buy the book now so I have a photo of the quilt now. I love your Positively Transparent quilt, the machine quilting is amazing. How neat that Cursive has traveled to so many places! I go to see it in Savannah and it is still one of my favorites. Fantastic for you Paige. I always loved Cursive, I think unfortunately hand writing is a dying art, your quilt gives me a happy feel when I see it. 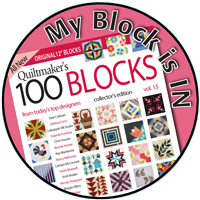 And your plus quilts were great too, so many variations on a theme, love it.